When you try to safely remove a USB flash drive or an external hard drive from the computer by right-clicking on the device icon in the system tray and selecting “Safe to remove hardware”, sometimes it gives you an error that “it is not safe to remove hardware”. This error message prevents you from disconnecting their device safely because it is being used by another window or program. This is a complete error message. 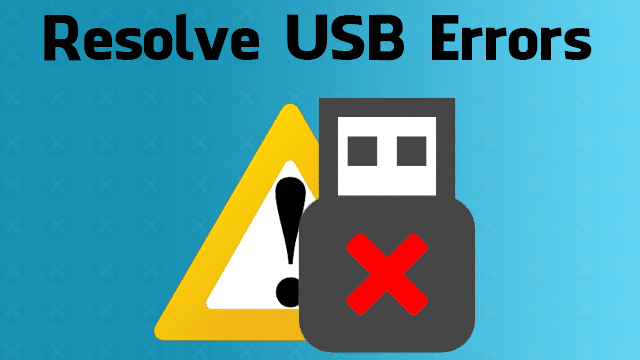 What to do with a USB storage device in use Error? Determines which program is currently running on the device and closes it. However, the real issue might be not that simple. Most users had nothing open or running when they receive this error message. As a result, they simply ignore the error and disconnect the device anyway resulting in loss of data. Now the seemingly small problem becomes serious enough. As a result of the abrupt removal of a USB device that is currently used in a process, the device will suffer an even more serious problem. Most likely, you will receive other USB problems, like USB external hard disk is not accessible, access is denied or the external USB hard disk can not be opened. If you have tried the general methods, including logging out and logging into the system, reboot the system once or twice but still could not eliminate the error then check these three steps to disable the program that the USB resource is taking. Press the Ctrl + Alt + Delete keys to open the Task Manager . Access the Task Manager, on the Process tab , find the applications that are using the USB device. Right-click on the selected application and select End Task . Right-click on My Computer (Windows 7) or This PC (Windows 10) and click Manage. In Storage , click Disk Management . Find and right click on the USB device you wish to remove and click on Eject . (Note – If it is an external hard disk that you are going to disconnect in Disk Management, you will have to choose the option “Deactivate.” The next time you put the unit back in the computer for your use, you must return to the Disk management and put it in the “On screen” state. Start -> Control panel -> Hardware and sound -> Device manager . Click on Disk drives . All storage devices connected to your PC will be displayed. Right-click on the device that has the problem you want to eject, and then select Uninstall . Click OK if you are asked to confirm the operation. Wait for the process to finish and then remove the device. Matt has been playing video games since the day he learned how to (duh). He still remembers his first ventures into SEGA Bass Fishing. Matt loves most gaming and tech to make sure that his title of "Geek" is well earned! Artes (noun) - studies intended to provide general knowledge and intellectual skills. TechArtes strives to do the same with Technology, Gaming & Mobile. Copyright © 2019 TechArtes - Best Tech Community on the Web!